Every important event needs a beautiful program for guests. Not only is it a great way of communicating scheduling, providing directions to certain areas, and other logistical necessities; it also serves as a meaningful keepsake for years to come. 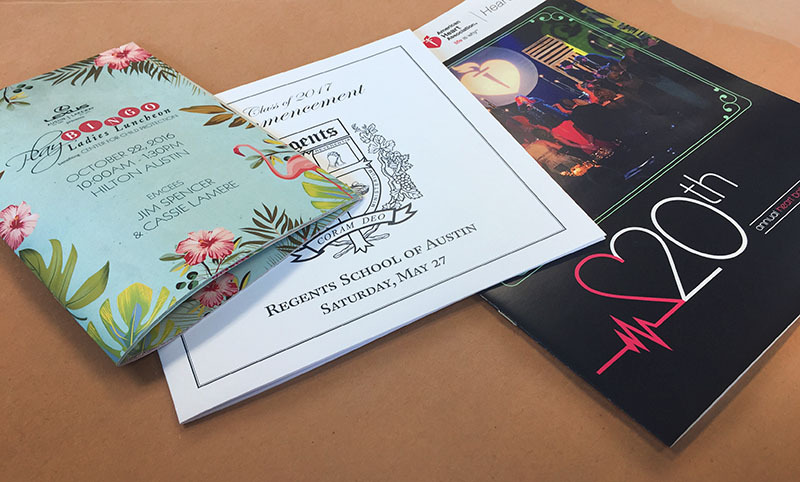 Your event program should reflect the overall attitude and style of your event, setting the mood for attendees as they receive it, and stirring their memories when they look back. We have a variety of fine papers to choose from, as well as eye catching finishing touches such as metallic foils, embossing, and custom folds. Contact our team today to start designing your custom event program or get an estimate for production of your existing design!